« Lewandowsky’s “research team”. Who is Mike Hubble-Marriott? How well did that 50 degree forecast work out for the BOM? You could almost be forgiven for wondering if the Bureau of Meteorology is a science unit or a PR agency. They seem professionally adept at getting headlines, but not so hot at predicting the weather. On Jan 7th the BOM models forecast 50 spanking hot degrees across hundreds of square kilometers in central Australia. But it was a whole week ahead, the prediction itself cooled with a day or two, and in the area under the “purple searing spot” the result on Jan 14th ended up being around 40C instead. That’s fine in itself — predictions are difficult. What’s not fine is the PR storm that ensued, which is still being used, as if somehow the very fact that our faulty climate models predicted a record temperature (but failed) is evidence of man-made global warming. How many thousands of people all around the world now think that Australia had a 50C plus day this January? Did anywhere hit the fifty mark? No report of one so far. Watch the loop of Australia’s January temperatures here. The highest brown bar on that graph is 45 – 48C, and those hot spots are a thousand kilometers from the purple patch. That said, it was awfully hot for a couple of weeks. Birdsville got to 49C on Jan 13th. Moomba 49.6C on the 12th. But even these temperatures are not “a new climate”. How many people around the world realize that 50C plus days have occurred many times before across Australia? Even if it had got to 51C, there are many approximate equivalents in the last 180 years. It’s like trying to rewrite history. The BOM were probably 100 years too late in adding colors to the scale. They should have been there all along. The wild PR success of the “new colours” meme, meant that newspapers all over the world carried yet another free but disguised advert promoting bad government policies, poor science, and fraud-prone and unnecessary marketing schemes. Did the BOM push this angle, or was it the media? How big was the fuss? The message made it to Australian newspapers everywhere. In the SMH the headline read: “Temperatures off the charts as Australia turns deep purple.” Then there was Adelaide Now, The Age, The Courier Mail, Plus Australia Popular Science. Wired at least had a different take: “Australian Heat Wave Threatens Gadgets…” (This heat must be really serious). Climate Central “researchers and reports the science of climate change”. You can tell a lot about the level of scientific understanding there, because they included a map of the world for their readers and circled the nation so the climate savvy readers knew where Australia was. At least they got that right. The day after the 50C potential heatwave didn’t get that hot either. Today’s record temperatures in Sydney come just 10 days after the Bureau of Meteorology added new colours, purple and pink, to its weather map to denote temperatures once considered off the scale: 50-52°C and 52-54°C respectively. Those temperatures were not considered “off the scale” in the 1800s. Australia was hot then and it’s hot now. 95 comments to How well did that 50 degree forecast work out for the BOM? Would you post up Jim’s forecast for the next week and we’ll compare against the BOM. BTW: Joanne, your colour schemes are out of whack one graph does not match the other. Oh, and how did the BOM compare to your own forecasts? Oh, and Jo, your temps for the 1800′s; measured on the same equipment as todays was it? Properly shielded from the nearby radiation. I’m sure you’ve checked this because you are so “skeptical”. Right? Equipment from 1800′s was probably as accurate as it was required to be … no more no less than today. In fact, there’s no equipment available today that can measure accuracy to 2 decimal places either. Why don’t BOM give temperatures to two decimal places? What’s the accuarcy in decimal places of the current BOM thermometers? And what is the error margin? Well exactly how damaging is it to have a temperature recorded as 32.6 Deg C instead of 32.64? If the overnight minimum is 18.00 deg C then the missing 0.04 not recorded is just 0.20 % of that day’s range. Also in may be useful to consider that at another time of the year the overnight minimum could be about 10 degrees. The point I am making is that if the IPCC is trying to assess the “heat content” of the atmosphere then given all of the errors in assessment of so many known factors and the presence of hidden unquantified factors in the “models” ( better labelled as Guesstimates) yet to be announced by the mob at UEA and WWF, then the extra digit is effectively Irrelevant. It might, however, be good PR to use the extra digit to suggest greater scientific accuracy for grant purposes but it has no impact on the Science. It would appear that the last digit is not too relevant given the circumstances of the experiment. What part of “approximate equivalents” suggests I think observations from then are exactly the same as today? Maybe next time your BOM will wait for >50 before going to the trouble of making and pushing the map out. Ya think? Just a quick observation but “Nice One” seems to have a bad day (lack of sleep?) now and then. She/he might be a good candidate for a Lewandowsky study. Unless the boiling and freezing tempertures of water have changed, there is no reason to expect older equipment to be any less accurate than modern. Maybe less precise. And if you think being inside a covered louvred box on a hot day is fun.. go and try it, please.. Much more comfortable on a shaded verandah, where temps might often have been measured. You’ll have to complain to your friends at the BOM. you appear to have delusions about my power to control what they produce. Me — I’ve had a 100% hit rate. I thought Summer would be warmer than Spring. 100% as well – I thought you’d avoid giving any sort of climate projection or be able to cite peer-reviewed material showing what’s caused the recent warming to counter the science I linked to. And so you will very soon be providing evidence, right? Rather than just “rubbishing” the models, you’ll present alternative calculations to show what’s causing the warming, right??? Yawn. Nice One. Your amnesia is so uncool. We’ve done this conversation already. This the part where I remind you that you are demanding my money to solve a problem you reckon is catastrophic, but you still can’t provide a single paper with empirical evidence (the one I’ve been asking for for three years). Oh, dear, bless your little heart. The request by someone with a failed theory to have those showing how it fails come up with a different theory has been rebutted in the literature for many years. One example was on Climate Audit (CA) five or six years ago and went (something) like this: Suppose ‘JN’ as a mining engineer with impeccable credentials you are requested by XYZ Mining Co. to investigate claims by New Onion Co.’s flamboyant chief executive (NO) that his latest find is showing an abundance of Gold. So JN investigates using personal experience, scientific principles, and data manipulation skills – and then tells XYZ not to make an offer on NO’s property because the find has been overblown or out-right faked. Upon hearing this, NO says “Well then, if you are so smart, tell me where I can find a rich Gold deposit!” — squawks, stomps foot, slams door. More evidence, less doubt Nova. That’s what a real skeptical scientist would provide. You mean like the 16 years of no warming Noisome One? Oh, not to mention the additional years of stasis that the MetOffice has forecast. Now slink back to your cave! … no, he made the predicton for the South Island East coast. There’s a big difference: the wets coast is quite a bit cooler than the east coast as it catches all the cold air and rain directly from Antarctica. The East coast catches the dry and hot north easters from the mountains. Previous 40 degree highs were at Rangiora (Christchurch, East Coast) and Timaru (also east coast). A heatwave? How much do they want for it? Tell `em they’re dreamin’ ! Their choice of colour for the 50+ degree range is also potentially revealing. They say purple is the colour of frustration. I think the BoM boffins are silently crying out for help. What is the difference between a BoM ‘climate’ scientist and a AIS ‘sports’ scientist? You choose… One pumps drugs into the arm, the other stumps mugs with alarm. Be easier to ask what they GET RIGHT? Current Cyclone Warning is correct. Water temperature over large area of deep water over 30 degrees. Cyclone coming soon. No, not tomorrow. According to the prediction heat map up top BoM were predicting -25 degrees in South Australia! O/T I know but I put this up at Jennifer Marohasy’s blog and thought others may be interested. The Petition Project has 31,000+ scientists and 9,000+ with Phds at their site. They are very sceptical of the warmist propaganda and have prepared this study covering a lot of issues of climate change. There are many graphs to look at and references at the end to consider. The gray background is not part of any scenario – mentioned on the WUWT post where this graph is used. While the drawing (Figure 1.4) is from the ‘draft report’ that will likely change, I have not seen any comments that the information in the drawing is incorrect. I point all this out because you mention posting at Jennifer’s site. Some folks might need to have this sort of update. It looks like the BOM is being directed by politicians – you know politicians – they’re the ones who did BAs or Law at University because Maths was just too hard. It would appear temperature is racing ahead of CO2 rising from the compost rapidly piling up in the corridors of the BOM, the poor dears must be in a frenzy having to draw a new map. Perhaps they need a new air conditioner or two and relocation of their thermometers away from the heat exchangers? Lack of professionalism or integrity readily springs to mind. An example of alarmism in corridors where we expect (and pay for) science to reside. It was recently suggested economic forecasters make weather forecasters look good. Is this a return bout to regain the high ground? The colour red should be one of embarrassment on the faces of those in the BOM who promoted the facade. Or is the purple designation a Freudian slip illustrating their rage over sceptics not accepting the warmist doctrine? When repeated often enough (especially by fellow travellers) an assertion or deliberate lie morphs into “truth” in the minds of the gullible. Is this yet another example of the politically motivated brainwashing strategy, illustrating the level of infiltration by activism in taxpayer funded agencies (their ABC also springs to mind)? Australia was hot then and it’s hot now. Don’t you mean “hotter now”? What with the average January max breaking the 1932 record convincingly, and with Sydney and Hobart recording their hottest days ever. Hey John have you checked out the BOM station site in Hobart? Easy to find on Google Earth (or Maps) Ellerslie Rd – right at the end (No.20) in amongst the Anglesea Barracks. Isn’t that a great site for a weather station. Come back and tell us what the impact of all those buildings might be. I wouldn’t hold my breath waiting for a response from JB that requires him to be a physicist instead of an activist. He has never responded to such challenges with a coherent argument based on physics and hard science. Mr. Watts has since move the project to ‘ surfacestations.org ’. I looked, with Google Earth, for the BOM station as you suggested but a post following ‘the surface station project’ outline would be nice. Thanks John and yes I am aware of Watts’ work and a regular reader of his blog. But taking one month is just cherry picking. We have also had the coldest February for some time. Where a particular week or month stacks up has no bearing on any nation wide trend, and a nationwide trend has no bearing on a global wide trend. It simply becomes an interesting but not particularly valuable statistic. Is the change caused because of the change in the location of the magnetic pole due to changes in magnetic variance due to cosmic flux? See how silly it is to ascribe one possible variable as the un-proven dominant factor, and one temperature point, be it a day, a week or a month can simply be observed as something interesting but it certainly does not prove a long term trend. There are many factors which effect CO2 emissions but at the moment only about 15 percent of countries are reducing their CO2 emissions. Sure, maybe George Washington did chop down the cherry tree, but there are alternatives. There are known instances of cherry tree suicide by axe, for example. And what if a time traveller came back from the future, and realised that the George Washington mythology wouldn’t be complete without a healthy cherry tree, so they chop it down? I am trying to get the BOM to supply the error bounds for their statement that a new record since 1932 was set for Australian aggregated temperature – so far no co-operation just refferal to the Australian year dataset which contains no error statement. How scientific is that. I also requested an answer to the following question: If this year was over the 1932 record and related to global warming does this mean that gloabal warming was present in 1932? Good point to bring up the error limits of the BOM’s quoted figures. Not because they are terribly relevant, I think that one temperature reading does not do much for the basic proposition we are exploring; namely whether we have more heat in the atmosphere now than there was in 1932. Your comment illustrates their very basic “Lack of Pride” in their work. From a scientific point of view it is always better to get a “more accurate reading” but after you have done that, the next step should be to work out how many significant figures are relevant in the followup processing. In the situation where we are trying to ascertain whether additional “heat” is accumulating in the Earth’s biosphere I would propose that 3 significant figures is enough and that greater resolution of the analysis would come from a larger number of readings taken over a grid pattern. No doubt satellite temperature measuring systems can do this. Satellite records would probably illustrate the fickleness of parcels of “hot air” as they move from one temporary location to another over the day and the pointlessness of large numbers of significant figures. As a number or people have commented here; the BOM’s mission was to create the Impression of a new temperature record in accordance with CAGW theory and they have certainly achieved that political objective. People remember the 50 degrees C figure, they remember the Purple Heart and so on. It is stuck inside their brains. There WAS a new record in Australia; they saw it one TV. It’s just a shame about the “Science”. BOM uses new software obtain from the UK MET Office. The UK Met office have been predicting extreme heat for some time (because their s/w factors in “global warming” as part of its prediction. So, no surprise, Oz BOM is now predicting lots of heat too. Time for the s/w to be tweaked. Down south, its actually been one of the coolest summers in ages. A few hot days but no real long periods of extended heat, no run of 5..10 days of 35+, no extended runs of nightly mins of 28+… a week or more recently where we had to drag the blankets out at night. Very pleasant. Some pretty impressive records here, overshadowing even the BoM’s pathetic “prediction”. Imagine the reaction if this happened today..
We now live about 28 kms from the coast so the heat waves of the Upper Hunter Valley are a distant memory. Here we had one very hot day a few weeks ago. Got to 42 on our verandah. We couldn’t use the A/C because the gold plated power lines couldn’t handle the load. We had a six hour blackout which finished just as the sea breeze cut in. Back to the subject; it was one hot day followed by several cool ones followed by another hotty followed by more cool days. Heatwaves are more than five days above 40 and nights that barely cool. None of those here. I think Abbott should float the idea of a BoM that keeps records only. Sack them all and then sack the CSIRO. I posted those diagrams here on the 15th January 2013. Hey Louis I wonder who signed off on that as an exploration target. Missed by that much! Most likely a geophysicist since geologists are not into modelling geophysical parameters from long experience. Here are just eight examples of where the UN-IPCC missed predictions. Blame the computers: These non-linear events are notoriously hard to model. There are no perfect computer models. All are incomplete representations of nature, with uncertainty built into them. And they said the science was settled. When people claim that science is settled, you know what they are really talking about is a religion. with uncertainty built into them. More like ‘political certainty’ built into them. Perhaps rather than “incomplete representations” it should read “complete misrepresentations”? Sounds like a more accurate assessment to me. Is that alliteration or transliteration? This has nothing to do with science and everything to do with the right message for the sheeple. The BoM is just another branch of the goverment remember so the PR and spin is everything for a reason, read the link to understand why the message is all important and not the science behind it. Say what you want but the mushrooms of society lap it up. Alice Springs gets special treatment? Look at the strange shapes of the contours around the Alice on the animated flicks. Problem is, there ain’t so many weather stations close enough to Alice to cause the shape to change like that. Methinks the contour package is home made or about 50 years old. Perhaps it’s a spin off from Federal Government intervention in Territory affairs. The colour choice makes me think the BOM are under contract from Revlon to develop lippy shades for the locals. The Exmouth peninsula seems to get special contour treatment also. Any explanations for the contouring? Today’s Farm Weekly, section 2 on it’s back page Weather Watch has a heading January hottest month on record It begins – Australia recorded its hottest month on record in January 2013, with both the average mean temperature of 29.68C and the average mean maximum temperature of 36.92C, surpassing previous records set in January 1932. Etc Signed Bureau of Meteorology. We all know it is bull sh!t. When they do things like this (GISS uses BOM data), its not really a surpise that old “adjusted” records get broken. Add Steve Austin to the list of Skeptical Journalists? 1. Is global ATMOSPHERIC temperature warming unusually in either amount or rate and is it continuing to rise? 2. Does the level of carbon dioxide (CO2) in air control or determine Earth’s temperature? Its one of the factors that do. 3. Does human CO2 production determine the level of CO2 in air? There has been a dramatic increase in atmospheric CO2 over the last 150 years. Over this time humans have pumped an awful lot of CO2 into the atmosphere. But this could just be a coincidence. Maybe its leprechauns. 4. Is warming catastrophic or even damaging? Is global ATMOOSPHERIC temperature warming unusually in either amount or rate and is it continuing to, rise? Well No, No and No. Any historian will tell you that. Does the level of CO2 in the air control or determine the Earth’s temperature? Well No, there is no evidence for that at all! Does human production of CO2 determine the level of CO2 in the air? It might be a factor. There is not enough understanding of that. Human production of CO2 is still a small part of the CO2 sources, despite the seemingly large amounts being produced..
Is warming catastrophic or even damaging? CO2 is not causing warming. The warming is not catastrophic and seems to be beneficial. Yogi Berra was just kidding, right? I mean, don’t they make accurate predictions about the future all the time? Al Gore certainly did, didn’t he? You have my avatar bro. As renewable energy becomes cheaper, dirty coal power could soon be extinct. That’s just hilarious – pity they only work 1/3 of the time. That is truly scarey stuff. Leading the green tinged to maintain the focus; despite the facts. Even otherwise intelligent scientists from the CSIRO state that renewables will be cost effective when the price of “carbon” is at the right level. The CSIRO scientists are great at Science but they sure don’t have even the basics in Economic costing of alternate energy sources. The fact that average normal people, who trust the media, are subjected to this sort of deliberate propaganda is disgusting. Hell, it’s 2013 and we are still being lied to by pressure groups under the watchful eye of the Thought Police who dumped on Bolt not so long ago. writer and publisher and publicly shame them? The thing that really bugs me is that idiots like Peter Hannam can publish, without any public feedback section. Most of the dates were, to my recollection, ‘pre global warming/climate change’ – but let’s not put the alarmists off with facts, eh..? Please don’t feel bad about it. Our official weather predictions don’t stand up any better than yours. And they sometimes try to make as much hay out of them as they can. If anything can be made sensational then it will be made sensational — doggone it, I think I’ve discovered a new natural law there. The difference in the max of 5C is significant. It is the top end that does the real damange, not the bottom. By overpredicting you can easily double the area under threat. You become terminal at the top. When the point is alarm, there is no upper limit. When the purpose is to enable people to reasonably prepare, the upper limit needs to be as close to reality as you can. Am I the only one who’s surprised that the BOM didn’t claim that the failure to reach the predicted temperatures was itself evidence of “extreme climate”, or whatever they call it? They missed a trick there, didn’t they, or wasn’t I paying attention? 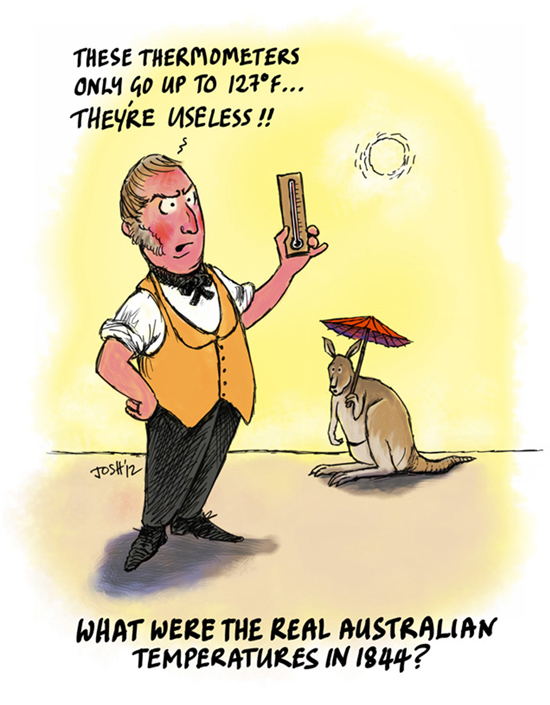 The climate’s so bad, you can’t even predict it, any more – or the BOM can’t, anyway (and the British Met Office gave up even pretending to do a decent job about twenty years ago). I think this is another case where the forecast is so widely repeated that most people end up thinking this is what the temperature actually is! Think back, how often does anyone actually quote today’s temperature on the news? Now, how many times do they quote the forecast for tomorrow, or the day after or next week? Which one do you remember? It doesn’t matter what they then turn back their final forecast (or actual report) to, because the inflated early forecast is all that is remembered. Here in Canada, weather forecasters have stopped giving the actual temperature when it gets hot (high 20s or 30s) because it is not scary enough – now they add the “humidex” value to this and quote what it “feels like” as though this is the actual temp. Thus 25 becomes “feels like 32 – and it’s only May!”. How good are you (or anyone) at actually “feeling” temperatures? Since we are usually either inside or, if outside, then we are doing something making us feel warmer (or colder), we rely on what we are told the air temperature is. But what the temperature actually is is rarely given – instead we have forecasts and humidex numbers (or wind-chill numbers in the winter) all designed to make it sound ‘worse than we thought’. This would be fine if we accepted that the weather reports are just stingers to keep us watching during the commercial breaks in the news bulletins, but now we have politicians spending big chunks of tax-money to combat something that pretty much cannot be altered. It is about time we called out weather forecasters on their accuracy, or accept that they are just light entertainment. removed by a moderator because it didn’t abide by our community standards. Replies may also be deleted. So according to Damien Carrington and The Guardian pointing out facts about climate are not appropriate “community standards”. Oh come on! You want us to take your work that you were polite? Post your actual text here so that we can judge for ourselves. Yes John I was polite, you should try it sometime. Mackay sets new January record (39.6C). Same website, different figures. Other top temp wrong as well. What’s going on? Also posted on Warwick Hughes who has done some further research. This is happening all the time. We can no longer trust the data we are getting. I saw the other week that Canberra’s hottest day for January got pushed up by 0.4 degrees, just to make it hit the mark. And on the one really warm day that January had, the automatic weather station at Obs Hill in Sydney topped out at 45.3… where did the extra 0.5C come from !????? Nobody knows. The temperature rose 0.9C in 6 mins and then dropped 1.0C in the next 4 minutes according to the AWS at Syd Obs. A hot burst of wind, perhaps. Someone opened door to read it ? They sure didn’t get the reading from the AWS, so it must be a manual reading. The the usual guff about racism, legal matters, spam etc. The platform is ours, but the conversation belongs to everybody. Well everyone who goes along with The Guardian and its’ journalists’ point of view anyway. Maybe the Australian BOM should learn from the BBC on realism in weather forecasting. No seriously. The weather forecasts for a the next 36-48 hours are by the hour. For the following 3 days they are every 3 hours. For 4 days further ahead it is just a range of temperatures for day and night. Based on the British Met Office, they have learnt to incorporate the uncertainties. See for Manchester, where I live. http://www.bbc.co.uk/weather/7281603. At the time of writing (Nearly midnight on Thurs 7th) the range of temperatures are 0/9C for day and -6/6 for night. That relates to be the forecast being extremely cold to quite mild. Try this for any place in the UK – e.g. London. Less detailed are for foreign (Non-UK) places. But try some Australian cities. Perth is about to have 5 days of really hot temperatures lets see how many make it over the forecast. Its the bloody humidity that I’m not looking forward to! And here in Bribane it’s 26 and cloudy with some rain . Rule 5: Facts don’t matter, it doesn’t have to be right. As long as it’s published first, public gullibility does the rest. Sochoples,if you read the comments further on,you would have seen I corrected my mistake.Point is,Salinger got a huge FAIL.Par for the coarse for warmists. Seriously? They’re not magicians. They created new colours because by their predictions, it looked like it was going to reach those temperatures at that time. This was then revised, as happens constantly, because that’s what science does, it reviews and revises. Jesus Christ I worry sometimes. Well you should because it is generally acknowledged by meteorologists that their forecasts are about 50% right. This is more or less a tacit admission that the forecasts are random, and random behaviour is intrinsically unpredictable. This means that the models used for forecasting are not accurate at all and means that we actually do not understand the physics behind the weather. We do have gravity worked out because we can forecast the behaviour of, say, a projectile fired into the air and its landing spot. Newton’s Law in this respect is well understood and our forecasts of the projectile trajectory would fall into the 90+ % success rate. But we do not have the weather worked out despite the billions of research dollars thrown at the problem. The late Fred Hoyle pointed out that when this happens in a science, it means that the problem is being investigated with the wrong ideas, ie., the physics of the problem is wrong. I should add that weather is recognised as a non-linear, chaotic system that cannot be predicted. The BOM created the new colour legend as a consequence of its computer modelling of the weather system, and that the forecast was not achieved simply tells us that the model has to be wrong. The real problem is that the global warmers or climate alarmists don’t or can’t, the difference is moot, accept that maybe the theories behind their models might be wrong. Hence they look for anything else to explain their faulty forecasts. It’s a real worry when the likes of Kevin Trenberth question the validity of the data when in effect he should have been questioning the validity of his climate modelling. No conspiracy, just plain pseudoscience at play. I find it interesting that both the BOM and Jim Salinger (ex NIWA- NZ) have used this hot summer on both sides of the Tassie to push the possibility of new heat records for both the Australian continent and New Zealand, the latter record that recently celebrated its 40th birthday (Feb 7th)BTW. For Salinger in particular and possibly for those at the Bom pushing this wishful thinking in the Australian setting, the fact that the old temperature records are still here and getting older must stick in the craw somewhat! It was actually embarrassing to watch Salinger play his hand like this and fail. How dare nature not cooperate! I wasn’t surprised though. Ten years ago when it was part of his job to predict as far ahead as only 3 months he failed to foresee the last great drought in our part of N.Z. I was at a meeting where Salinger addressed a public audience and admitted this fact after being questioned by myself,an interested lay person, and a dairy farmer. Both of us saw the signs of drought as soon as it started. I guess the famous Dr was too busy saving the planet to actually pay attention to a small bunch of people contributing to his salary!